Your ability to obtain financing, rent an apartment and even get a job might all depend on your credit score. But it’s hard to get credit without a score. 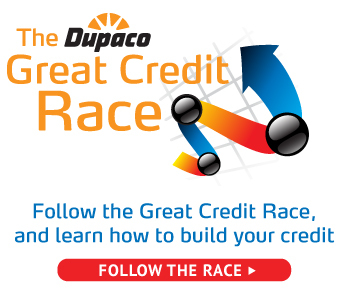 Twelve members of Dupaco Community Credit Union are well on their way to establishing credit by participating in Dupaco’s Great Credit Race. Schedule a free Credit History Lesson to receive one-on-one credit coaching from a Dupaco expert. You’ll learn what makes up a score and receive personalized tips on how to drive it up to help you qualify for the lowest rates possible when you’re ready to apply for a loan. A Credit Coach Loan can help you establish credit—and get you in the habit of making loan payments. With the low-interest loan, the money that’s borrowed is secured in your savings account for the term of the loan. You earn interest dividends on the money held in savings while payments to the loan help build credit. Another way to establish credit? Follow the lead of the Great Credit racers by opening your first credit card. The length of your credit history makes up 15 percent of your score, so it’s important to establish credit as soon as you turn 18, Strautmann says. “Your oldest credit has a big impact on your score,” he says. When you open that first credit card, remember why you did so. Even without making purchases on your card, you’ll begin to establish positive credit. For the first several months, consider charging just one small purchase you were already planning to make each month. That will help you get in the routine of using your credit card and, most importantly, paying off your balance in full and on time every month, Strautmann says.